Defeat Coren Direbrew in the first wing, Blackrock Depths, to unlock two copies of the card. Once you have earned the regular version of Grim Patron, you can craft the golden version for 800 Arcane Dust. 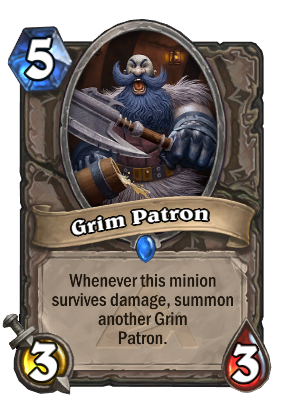 After this minion survives damage, summon another Grim Patron. If you love getting your face punched, come to the Grim Guzzler! Now he'll conquer the Rumble Arena. I'll root for you, get in there! "A fight? count me in!" R.I.P Warsong Commander. Used to be good. Hoh, I remember the days. Am I the only one who noticed his "split" phrase changed from "Hey you lot! Get in here!" to "Hey everyone! Get in here!"? Whats the interaction between Grim Patron and Mistcaller? If the patron gains the Mistcaller buff does it summon a 4/4 copy or a 3/3 copy when damaged? I just realized patron warrior will finally f**king die for good next year. YESSSSS. I do love a good Patron Warrior. The counter to C'Thun we needed?